Last week the League of American Orchestras held our industry association’s 71st annual conference in Baltimore. 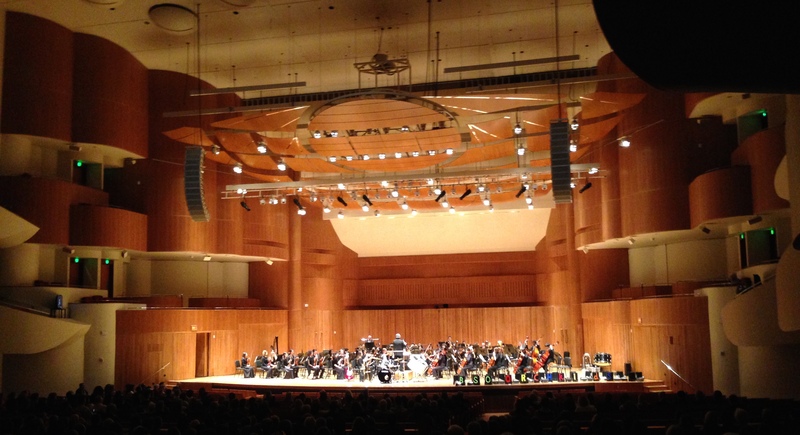 The national event was hosted by the Baltimore Symphony Orchestra and brought hundreds of representatives from orchestras across the country – as well as other related organizations – to share dialogue, strategies, networking, and of course music, in several packed days of intense conversation. I was there for the entire conference, not only as a first-time attendee, but as a speaker – it was my honor to represent Music City and to share about the Nashville Symphony’s groundbreaking Accelerando program with orchestra education and community engagement staff, El Sistema educators, and other interested parties from across the country. Diversity was the theme of this year’s conference: it was titled “The Richness of Difference”. All of the plenary sessions focused on this topic, and a number of the elective and constituency sessions were about diversity as well. As I have written about here on Off The Podium before, American orchestras do not reflect the ethnic diversity of the communities they serve. Read more about this here, here, here, and here. 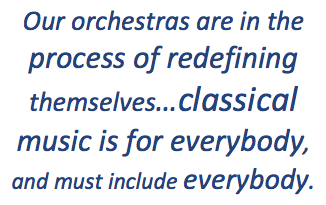 This would not be an issue perhaps, if classical music was “culturally specific”, but our orchestras are nonprofit organizations whose mission statements define us as servants of the community, and we survive in part by qualifying and receiving public money for the fulfillment of this mission. Our orchestras are in the process of redefining themselves. No longer exclusive purveyors of a pure European tradition, U.S. orchestras are slowly – and in some cases it seems, reluctantly – coming to the realization that in order to survive, we must change, and this change must be inclusive of the ethnic and cultural heritages in our respective communities, at every level of our organizations: programming, musicians, staff, administration, board, and audience. Classical music is for everybody, and must include everybody. The conference packed a lot into a few days – I arrived early in order to attend a seminar for the education constituency the day before the conference proper began. We spent an afternoon with a “deep dive” introduction to the Baltimore Symphony’s renowned OrchKids program, which serves over 1000 children in PreK – 10th grades in 6 Baltimore public schools. The seminar included presentations by Baltimore Symphony and OrchKids staff; Ayanna Hudson, director of Arts Education for the National Endowment for the Arts; a tour of one of the facilities that houses the program (a public elementary school); observation of rehearsals of two OrchKids ensembles (in preparation for their performances at the opening plenary the following day); and a detailed discussion with OrchKids Artistic Director Dan Trahey. OrchKids is a stellar example of an orchestra rolling up its sleeves and getting to work in their city: a successful community impact program that demonstrates not only the orchestra’s relevance to the community, but their tremendous and irreplaceable value. The Baltimore Symphony’s music director Marin Alsop spoke at both opening and closing plenary sessions, and conducted Friday night’s impressive Baltimore Symphony concert at Meyerhoff Symphony Hall: Copland’s Appalachian Spring with dancers from the Baltimore School for the Arts performing Martha Graham’s original choreography, a world premiere commissioned by the BSO of a piece by James Lee (an African American composer), and works by Thomas Adès and Ravel. Like anyone’s experience attending a conference like this, my days there were a whirlwind of attending sessions and meals, catching up with friends and colleagues in other cities, sharing our work with each other, and making plans for the future. Sessions I attended included New Education Law, New Opportunities; Developing Your Diversity Plan; Resourcing Diversity Work; and Music Education For All, and as I mentioned above, I was included on a panel to discuss Music as an agent of social change: Diversifying the Talent Pipeline. This panel was moderated by Ahmad Mayes, Director of Education and Community Engagement at the Cincinnati Symphony, and included Peter Landgren, Dean of the College-Conservatory of Music at the University of Cincinnati, and Stan Thompson, Founder and Executive Director of Play On Philly! and Board Chair of El Sistema USA. It was august company to be included in. 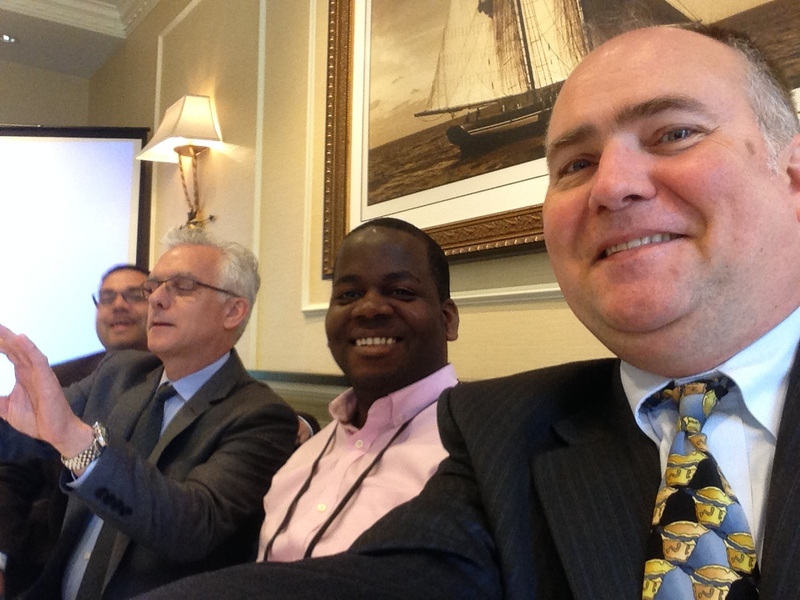 Kudos to the League for promoting diversity at our annual conference – it’s better late than never. As Jesse Rosen, President and CEO of the League remarked in the closing plenary, the League of American Orchestras hosted a conference on the diversity of American orchestras some 25 years ago, and was told by some of its prominent member orchestras not to do so again. Change in the diversity of our organizations in the last generation is negligible – especially change in the diversity of the musicians on our stages. The question is not whether to do anything about it – the question is, what can we each do in our own communities? How can we help each other? I did feel that the choice of title for the conference – The Richness of Difference – was unfortunate. In my opinion it alludes too obviously to the wealth, affluence, and elitism that so many in our society associate with the symphony orchestra as an institution. This association of classical music with wealth and privilege has got to change, if we are truly to create orchestras that exist for the benefit of all. For another perspective on this year’s conference, please visit my friend Garrett McQueen‘s blog post here. Garrett plays bassoon in the Knoxville Symphony. And click here to read a OpEd piece about the conference that was printed in the Baltimore Sun. By walterbitner in Community, Education, Nashville Symphony, Philosophy on June 15, 2016 .